Does paying for book promotion pay off? As an indie author, I’ve looked at paid book promotions from time to time and always backed away. There were so many questions for which I had no solid answers. Which promotion site? What guarantee did I have that it would work? How many books would I have to sell to break even? If I did a promotion, when? My novel Go Away Home published in July; was a September promotion too early? My memoir Growing Up Country has been on the market for seven years; would anyone still be interested? Finally I decided: Do it or stop thinking about it. I took the dive, and scheduled a promotion for my novel. I had to take a big gulp when it came to paying the bill and I spent a lot of my time holding my breath. Ultimately, I’m glad I did. Here’s what I did and how it worked. 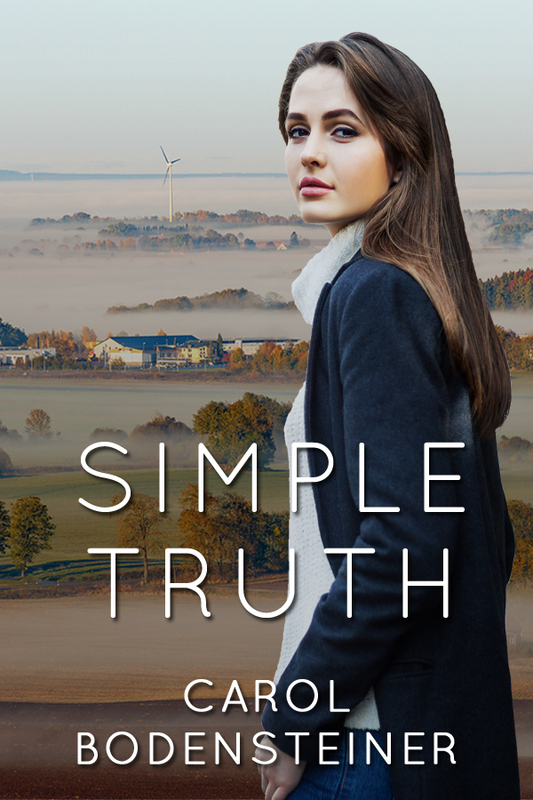 With the philosophy If you can’t go big, go home, I chose BookBub – the gorilla of ebook marketing in terms of reach, cost, and results – to promote my novel in September. Electing for as clean a test as possible, I didn’t do any promotion other than that. Not even social media. BookBub Cost: $400 for a one-day, $ .99 promotion. Reach: 1,030,000 women’s fiction readers. I’d requested historical fiction, but BookBub recommended women’s fiction. I figured they knew what they were doing and went with it. Plus the women’s fiction promo was $40 less expensive. 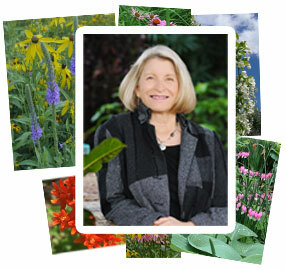 On to the next book: Encouraged by the success of the novel promotion, I elected to use paid promotions for my memoir. Again, I let BookBub lead the way and added two other paid promotion outlets: Ereader News Today and The Fussy Librarian. Here are the results. BookBub cost: $480 for a one-day, $ .99 promotion. Reach: 1,170,000 memoir & biography readers. Genre Rankings: In the course of the promotion, Growing Up Country ranked in the Top 10 – often #1 – in History, Family Relationships, and Midwest & Women’s memoirs & biographies. It’s a hoot: Okay, just had to get that out of the way. It’s a kick to see my book ranked up there with books by Sue Monk Kidd and Diana Gabaldon. Even if it’s only for a few days. Now back to business. Scheduling a promotion – BookBub is known for being tough to get into so I gave them as much scheduling flexibility as I could. They responded to my submissions in 48 hours and were easy to work with. I scheduled Ereader News Today & The Fussy Librarian to run in the days after BookBub to extend the news. You get what you pay for: There were fewer sales through Ereader News Today and The Fussy Librarian, but the cost was much less and they delivered sales proportionally, so I’d use them again. A long promotion tail: Even though sales dropped precipitously from promotion highs, both Go Away Home and Growing Up Country have sold more copies each day, every day since their respective promotions than they did prior to the promotions. Holiday cross-over sales: While paperback sales of Growing Up Country have always accelerated during the holidays, this is turning out to be particularly good year. 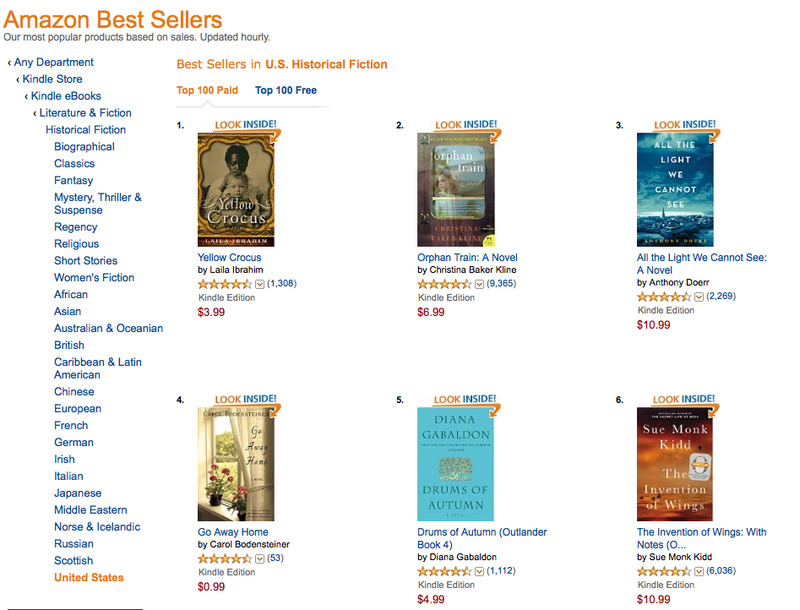 The ebook promotion drove the memoir to the top of the charts as people were looking for gift books. 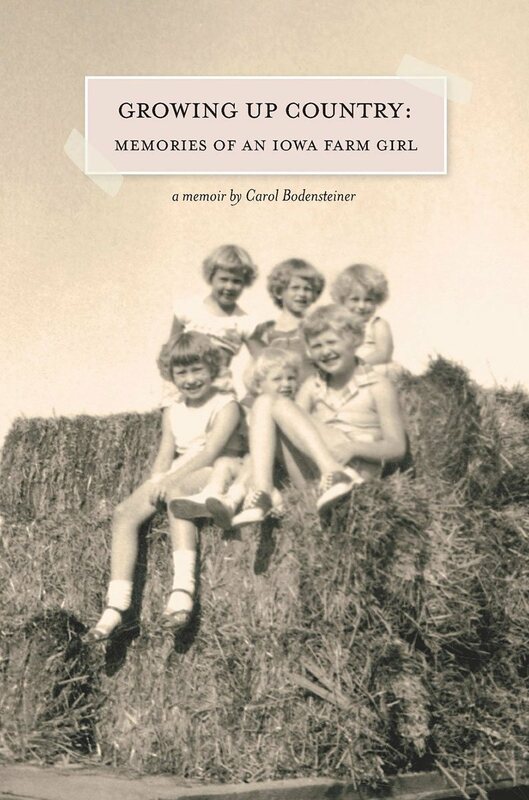 A month after the promotion ended, the memoir still ranks in the Top 10 Midwest memoirs and is selling well in both ebook and paperback formats. Reviews – A Bonus: Because of the promotions, both books have garnered a healthy increase in reader reviews. 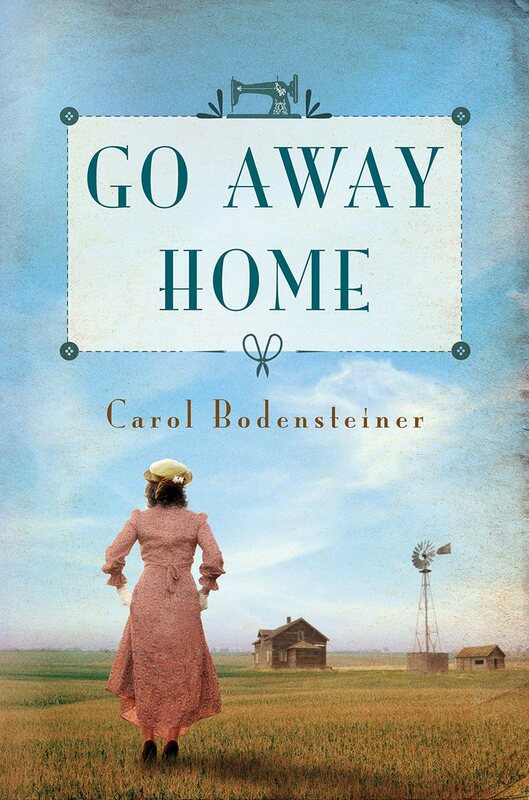 Go Away Home picked up 36 new reviews since September and Growing Up Country has earned 54 new reviews in the past month, including its first one-star review (be still my heart!). Your results will not be the same as mine: BookBub shares the average sales for each category. Women’s fiction: Average sold: 2,120 with a range of 170 to 5,420. Biographies & Memoirs: Average sold: 2,430 with a range of 290 to 6,210. I didn’t quite make the average with my novel but exceeded it with my memoir. Great success since I was holding my breath that I’d surpass 170 and 290. All the usual suspects come into play in whether a book sells well: cover design, title, quality of writing, topic interest, reader moods, the phase of the moon. I share this report for what it’s worth. Paid promotions are one arrow in the author’s marketing quiver. And this is one for which you can see a clear ROI. This was a lot of numbers to crunch and I hope I was reasonably clear. Let me know where I confused and where I might yet elaborate. Apologies for the blurry graphics; they’re the best I could get from a screen shot. ← Book awards – Worth it or not? Thank you for sharing the details of your experience, Carol. Very interesting and food for thought for authors as it seems to have been a very worthwhile endeavour for you. Congratulations on the great number of sales and the new reviews. I hope authors will find a couple of concrete examples useful. As they say in the investment business, “past performance is no predictor of future performance,” but my experience does give me confidence to use services like this again. Hi Carol, Thank you for the information and the “return on investment” breakdowns. I looked at BookBub and when I saw the $450 they wanted, I gulped . . .decided not to do it . . . your stats here indicate that they reached over 1 million readers. Impressive. So approximately, one percent of those reached purchased the book? I, too,had fun with EReaderNews – low cost, bumped me up there to the top of the memoir bestselling list on Kindle. The question becomes . . . how many times can you run a promotion before the book is “played out”? In any case, posts like these are instructional in terms of real numbers and investment return on books sold. I’ve always believed that indie publishers/authors are entrepreneurs. You’re a shining example of that. It is a big gulp, Susan. 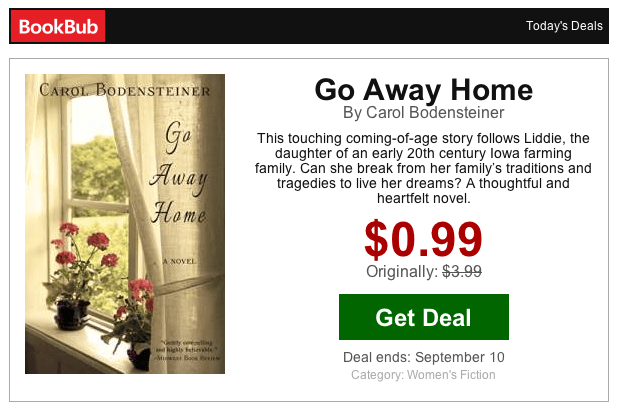 My sense is that BookBub could not get away if those prices if they were not delivering results. And the prices have gone up since I ran my promos. When I made my decision, I figured that half of one percent had to buy for me to break even. As far as how many times to run a promotion – at the moment, I don’t think I’d do it more than once a year. Just my gut speaking there. No numbers to support that thinking. Carol, I’m so glad you shared this experience. Thanks to your example, last week I took the same plunge, along with my publisher. And even though all the data have not yet been digested, I agree with your conclusions and had a very similar experience. It was a hoot for me to have 15 minutes of fame between Cheryl Strayed and Amy Poehler too. But even more importantly, over a million people were introduced to my book who never heard of it before. I can’t think of any better way to find readers. Now on to assess the long tail. I would be delighted to see those benefits develop also! It’s been fun for me to watch your success, Shirley. Our ’15 minutes in the company of author stars’ is an intangible benefit. Almost as good as the sales. Almost. I look forward to your report on the long tail benefits to your book. Carol this is immensely helpful. Thank you for sharing these details and the facts speak fro themselves for all the reviews and sales you have garnered. Congratulations and thank you for sharing! A few facts to consider as you think about promotions for your book, Kathy. I’m glad they were helpful. Thanks for sharing this valuable information. I believe that Book Bub is currently one of the more effective book promotion tools, and it helps to learn first-hand about an author’s experience and see real numbers. Apart from the immediate benefit of increased sales, the reviews you received represent both a short and long-term benefit. Also, let’s not forget reader exposure – similar to an ad viewed by millions – and increased awareness of your books and of you, the author. All the things you mention are legitimate benefits, Penelope. Many would pay as much for an ad to reach that many readers – without the attached sales. My sense is that awareness of me as an author is one of the reasons there is the cross-over benefit to sales of the other book. Thanks for sharing your paid book promotion results with us. It is extremely helpful to see how these promotions can work, even though we know each situation is different. I now look forward to running my own tests. Like you, Flora, I see each of these marketing efforts as a test. I’m glad mine were so successful. We learn, even when they aren’t. Good luck with your tests. Carol, excellent post and the data you’ve provided allows the rest of us an opportunity to consider these options. I’d like to share in my newsletter in January and will give “first appeared” credit to you and your blog. Thanks so much for sharing your experience. Share the post in your newsletter with my blessing, Sherrey. Happy Holidays to you and yours. Another wonderfully, informative post. Thanks so much, Carol. I wish you Happy Holidays. Happy holidays to you, too, Joan. Thanks for reading and commenting. Carol, this is a path I never considered. Congratulations on your success and thank you for shining light on this path. Those concrete, ROI results cracked my shell and got my attention. Delighted I could give you another promotional tool to think about, Sharon. Fascinating stats … but also exciting news …. I think this is where your love of and skill at marketing shows its worth. Congratulations! My marketing background means I’m always looking for new marketing tools to try. I could have used your skill at crunching numbers as I was writing this report, Mary. This is very interesting – thank you for sharing the data. I paid $25 for an EReaderNewsToday promotion last week for a historical novel and sold 150 on the day of the promotion, so a very similar experience to you with ENT. Are you exclusive to Amazon or are you on the other platforms? I just wonder whether you think that has any influence with BookBub? I’d like to try them next year but was rejected by them earlier this year. I’m currently exclusive to Amazon. Thanks for sharing your ENT results, Margarita. It’s confirmation that your results mirrored mine. I am exclusive to Amazon, so I don’t think that was the reason BookBub rejected you. I feel fortunate to have gotten in on first submission with both of my books; from what I hear from other authors, it isn’t always so. The one tip I have is to give BookBub as much flexibility on the date as possible. Others also encourage re-submitting. BookBub gets so many requests, you may just have hit them at a particularly full time. Good luck. I just ran a BookBub myself and am still in the giggly phases of my rank and sales. 🙂 It was great to read about your success – congratulations! I was curious to know how you determined your number of sales via FL and ENT? I used both as well. Were you able to request click or metrics? Congratulations on getting a BookBub promotion, Stormy. I know you had to submit more than once, which is a good reminder to all of us not to get discouraged. I contacted all three organizations and asked what they’d seen in click throughs and sales. All were glad to provide the numbers, though it took ENT a week or so to get back to me. Enjoy your happy dance! We new authors read all sorts of advice, but not much about how well it works. Your figures show return on investment which help us weigh our work so we can turn the writing life into the book business. You’re welcome, Paula. My business world background conditions me to always think about ROI. I’m glad to share whatever I learn since we all learn from each other. I am only one example and as they say “individual results may vary,” but the figures are a starting point. Good luck as you write and publish. Hi, Jackie, Thanks for stopping by and adding your results to the discussion. You affirm and up the bar on what we can expect from promotions. I particularly like your comment about never going in the red on a well-designed campaign. That’s a really important point. These promotions are well thought out. Not haphazard. You results encourage me and I hope other authors. Write on! Thank you for sharing this information. Like others, I see the cost, gulp, and shake my head. But your experience is encouraging. There’s no question it’s a big investment, Rosie. And there are no guarantees. But it’s worked for me and I’ll do it again. Thanks for joining the discussion. Carol, as a writer who’s just digging into indie publishing and trying to learn the business, I really appreciate your transparency and honesty. You’ve done us all a great service, not to mention being encouraging and inspiring. Thanks. This was a very helpful post on exactly the information someone looking at BookBub would want! We did BookBub Women’s Fiction in March 2016 and only sold 1011 books! So way below the BB average and your sales … we bought a Facebook ad on a popular genre Page, and did 7 other for-free ads, spotlights and guest posts during the sale before and after BB (6 days total). I’m glad the post was helpful, Kay. As I mentioned – and you found out – one book’s results may bear no resemblance to another book’s results. I looked at the BookBub average range long and hard before signing on. Someone is getting those low sales that make up the averages; I had fingers crossed it wouldn’t be me. You far exceeded the low end of the range, too. Thanks for sharing your experiences. Yes, Carol, but look at our dates — you did BB in late 2014 and we did it a year and 3 months later — the rise of daily book deals is huge in this time and I think that is one influence. Who knows the other factors, but it is always great to know of different experiences! You make a good point, Kay. As the reading public comes to expect these deals, and to sign up for more of them, each book really needs to stand out. So on any given day what will get readers to click “buy” – who knows? Thank you so much for sharing this! It’s very helpful. I’m considering using Book Bub in the future, but I wanted to see an example of what it could do. This breaks things down nicely! I’ll be bookmarking this for future reference. Thanks, Carol! Glad you found the information helpful, Bridgid. It’s not easy to get accepted by BookBub, but it’s worth it when you do. All the best with your writing and promoting.